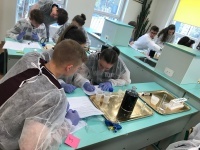 The Institute took the patronage of the 4th EDITION OF THE DISTRICT’S COMPETITION "THE GLASS AND EYE" organized by the Saint Thomas Aquinas Primary School, Junior High and High School in Józefów. The aim of the competition was to popularize natural sciences among students, to identify talents and to stimulate cognitive curiosity and creative activity of students. The competition was addressed to students from IV to VII grades of elementary schools and II and III grades of junior high school. It took place on March 23, 2018. It consisted of two parts: experimental part and the quiz. Almost 70 participants from various schools took part in the event. Representative of the Institute [R. Luboradzki] was a member of the Competition Jury and gave a lecture on "What is modern chemistry?" The lecture presented, among others, modern analytical methods, including physicochemical imaging methods developed by the group of prof. Wojtkowski.